President Trump on Tuesday asserted the controversial King Cove road through the Izembek National Wildlife Refuge will be finished soon. It hasn’t begun. Sen. Lisa Murkowski made a pitch for bipartisanship. With cameras rolling, they spent two-and-a-half minutes politely talking past each other. With Republican members of the House and Senate appropriations committees gathered around a large table at the White House, Trump asked Murkowski about the Arctic National Wildlife Refuge. Trump: Senator, how’s ANWR doing? OK? Murkowski: We are moving on ANWR. Then Trump asked about the King Cove road. Trump: But it’s almost ready. Murkowski: We recognize that process is going to be important here, and we are standing by the process. Thank you for asking. Trump: Good. This was a road that was — I guess it’s been — they’ve been trying to build it for 30 years. We’re going to get it done very quickly. It’s almost completed. Not quite. In January, Interior Secretary Ryan Zinke agreed to exchange land in the Izembek National Wildlife Refuge for the road corridor. But that’s about as far as it’s gone. Conservation groups are suing, saying the land exchange has to undergo environmental review. In the next breath, Trump seemed to acknowledge there is a pre-construction process yet to go. “We’re going to get it done. I’d say within the next couple of months it will be complete, and they can go ahead and build,” Trump said. While the land exchange is pending, the environmental review for the road itself hasn’t begun, at least not under the Trump administration. For controversial projects, the process can take years. Pleasantries out of the way, Trump invited Murkowski to say a few words. She spoke about the need for “regular order.” That’s where Congress passes spending bills rather than just passing a big package at the last minute to keep the government from shutting down. The Senate has just passed its first set of appropriations bills for 2019, and Murkowski said that was an accomplishment. Murkowski: But we have got to be able to work with our colleagues on the other side, sometimes as hard as that is. So thank you for encouraging us to do that because I think that that makes a difference. Trump: It’s been a very terrific group of people to work with. I have to say that. It’s not — we’re not finished. But it’s been a great group of people. When Murkowski said “our colleagues on the other side,” she meant Democrats. Murkowski was telling the president, and her colleagues, they need to cooperate with Democrats to pass bills. 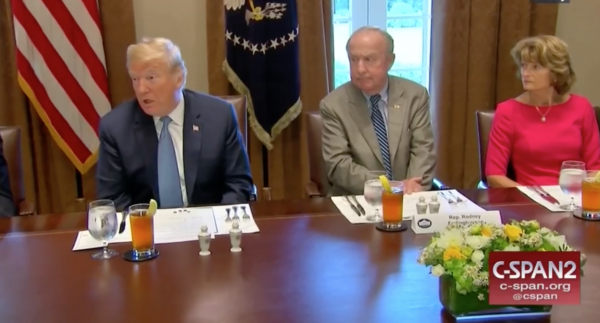 When Trump referred to “a very terrific group of people to work with,” he was looking around the room and did not seem to be referring to Democrats, none of whom were invited. Several times during the meeting Trump painted Democrats as uncaring about America’s security and obstructionist. “Their whole campaign is based around ‘resist’ — the word ‘resist,'” Trump said.